Brows,brows,brows. It’s the era of the eyebrow, from Audrey Hepburn to Cara Delevigne, this facial feature has dominated beauty looks for many a decade and now it’s having a moment once again. I can barely open a magazine these days without being greeted by preened, glossy, ruly facial hair but achieving the perfect brow is for many of us, like a quest for the holy grail, for no matter how many YouTube tutorials you watch you just can’t seem to master that arch. I’ve bought every product under the sun promising to turn my over-plucked, sparse eyebrows into thick, bushy red carpet worthy features that not only frame my face but accentuate my eyes, which I’m told is my best feature. unfortunately, however many thousands of dirhams I’ve spent (yes really) I’ve been yet to find a product I could relate to, until now. Introducing Hi Impact Brows’ all-in-one eye palette. This palm sized palette is not only the solution to the contouring the perfect brow I have discovered, but it is also a handy combination for achieving different eye shadow and eyeliner looks. 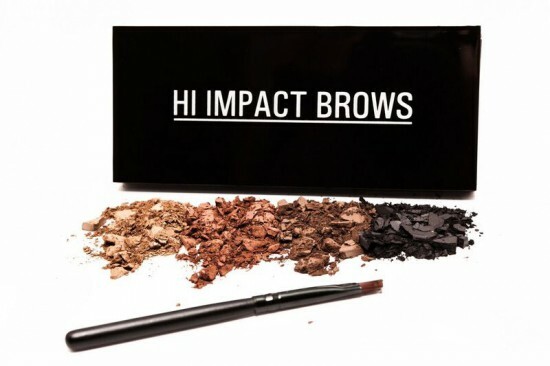 Available at Sephora Middle East, Hi Impact Brows has launched as a unique concept to achieve your personalized perfect eyebrow colour. At first glance your initial thoughts might be similar to mine; It is only has 4 shades. But this is where the trick lies, for these 4 shades are not only ideal for all skin types but their custom match technology makes them suitable to mix and match the colours to achieve your exact desired colour. The colour mix of Hi Impact Brows was actually developed over the course of two years to ensure that 4 powder shades are compatible for combinations into a series of looks suiting every complexion whether you’re blonde like me or have jet black tresses. I spoke exclusively to the founder of Hi Impact Brows, Dee Abdulla on everything eyebrow related as well as her top tips for obtaining the most beautiful brows. What in your opinion has surged the trend for defined brows over the past couple of years? It all started with the runway where bold natural brows graced the catwalks of Balenciaga, Chloe and D Squared among others. Couple this with the viral influence of celebrities such as Jennifer Lopez, Kim Kardashian and Beyonce who all flaunt perfectly arched thick brows, the beauty savvy women started taking notice and it all began from this point forward. Which celebrity in your opinion has the best brows? It has to be Sophia Vergara, she was born with perfectly symmetrical brows that she often claims she never plucks. Using the brush, begin by brushing in a dash of powder into the brow starting from the middle of the brow and out. TIP: Build the colour to your desired intensity but try not to go too dark to keep your brows looking strong, but natural. Using your wand or brow brush, brush your brows into place for instantly groomed salon perfect brows everyday. What are your top tips for achieving the perfect arch? Groom them to keep them as natural as possible. People often mistake the perfect brows by trying to create a shape that is nothing like their natural one, which often leaves brows looking too thin, or too un-natural and with so much messy regrowth, maintenance becomes a hassle. I’m a huge advocate of cleaning the brow from the top; trimming lightly and plucking only the excess to reveal an instant eye lift without over plucking. My top tip for any woman out there looking for the perfect eyebrow expert in their local salon, take a brow pencil and mark the shape you want using a thin outline, they can use that as a guideline and avoid over plucking. How did Hi-Impact Brows come about? We operate the largest beauty bar chain in the UK, and brows are the highest selling service we offer nationwide. This is why we wanted each of our clients to walk away with the best version of their brows every time, and this is not always possible with clients who have thin or scarce brows. It took us 2 years to develop the perfect palette that our clients can use to recreate salon perfect brows at home, and still use it for eyeliner and eye shadow if desired. The hardest part was incorporating the ‘’custom colour match technology’’ that allows users to mix the colours to create infinite shades to suit every complexion and natural hair colour. We started by selling the palettes in our beauty bars, then we began running courses on Hi Impact Brows through our beauty academy, after seeing the success of doing so, we decided to take this professional product to market, and the rest is history. Is there a universal one-shade-suits all for brows? Not really, as every persons brows are unique to their face and colouring. What difference does having defined eyebrows make to a person’s face? It makes all the difference. A defined brow gives an instant eyelift, creates an instant youthful look and I’ve seen thousands of our clients become instantly more confident the moment they look in the mirror, which in my 15 years of experience, always brings an instant smile which is the best accessory any woman can have – after the perfect arch. Is the product just aimed at women or should men be tending to their eyebrows too? Grooming of brows should be universal for men and women, There is nothing wrong with a man with well-groomed brows that are not overdone – the secret is to groom them so they look clean, but untouched at the same time. If anything, groomed brows brings out their eyes and makes them look instantly pulled together.